Izzie - Hello, hello. Let’s talk magnets. We’re here looking at magnets in this amazing workshop. I’m quite overwhelmed with all of the experiments we could do. What is a permanent magnet? Dave - Let’s start off by looking in a really really small scale. Some materials, like iron is one of them, have atoms with more electrons going one way round than the other, and that creates an electric current which makes a little tiny electromagnet. Now on its own this doesn’t make something even magnetic. These little atoms will be randomly arranged and the magnetism will average out to zero. But with some of these materials like iron, nickel and cobalt, for weird quantum mechanical reasons, these little tiny atomic magnets line up forming great big areas called domains with all of the magnets lined up. So all the magnetic fields add together so they can interact with things magnetically really strongly. Izzie - Okay. So it’s like they’re all acting in one direction so overall they have this sort of magnetic pull essentially? Dave - That’s right. And then if you put them near another magnet, all those magnets will interact and they’ll either stick or repel. Izzie - Okay. How is it that something can stick to a magnet but it isn’t a magnet itself? Dave - This goes back to the domains I was talking about earlier which are the small magnets inside a piece of iron. 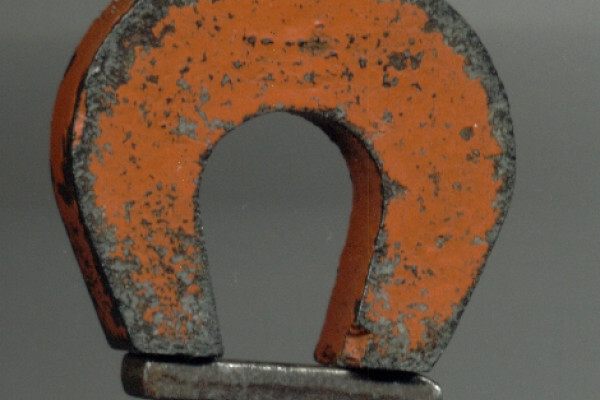 I’ve got a little metal nut here and inside it there are lots of magnetic domains and they’re all magnets themselves but they’re are arranged randomly so overall, it’s not a magnet. But if you put it near a magnet those domains will all twist round and line up so it becomes a magnet aligned with the original magnet, so a north pole is next to the south pole so it’s sticks. And we can see that because if we take a second nut it will stick to the first one, and a third nut will stick to that, and a fourth, fifth, sixth. Izzie - So what we’ve got here is lots and lots of tiny little metal nuts. On their own they’re not stuck to each other; whereas you bring a magnet into the game and all of a sudden one sticks onto the magnet. Then you can stick another on the one nut and so on and you’ve got an even bigger magnet essentially? Dave - That’s right. And with a material like iron, if you take it away from a magnet the magnetic domains just kind of randomise again and it stops being a magnet overall so I can take them off and they don’t stick to each other. Izzie - There’s a big difference between something being a magnet and something having magnetic properties. Take your fridge for example: you can stick magnets on it therefore it has magnetic properties, but it’s not a giant magnet itself. I mean, it would make taking cutlery out of a drawer rather problematic, and these iron nuts are the same. On their own they don’t stick to each other but because they have magnetic properties as long as there’s a magnet in the vicinity they’ll stick and act like an extension of it. But could we take one of these nuts and actually transform it into a permanent magnet itself? Dave - First of all we need to start with the right material. You want something which is really hard to twist these domains round, and one of the best materials for that is neodymium iron boron, which is an alloy of all those three elements. This is a lump of neodymium iron boron, and it will stick to a magnet but very weakly because not many of those domains are twisting round so it forms a very very weak magnet. Izzie - Okay. So how would we turn that into a magnet? Dave - What you have to do is make it easier to turn these domains round and the way you do that is by heating it up. Izzie - Oh. And bring out this giant blow torch. My goodness! Dave - So I’ll now heat this up to kind of orange hot. Dave - I’ve now put that down next to a very strong magnet and let it cool down slowly. Izzie - But how does cooling a lump of hot metal near a magnet then turn it into a magnet itself? Dave - Because it’s really hot, these magnetic domains can twist round very easily. And then, as it cools down it becomes harder and harder for them to spin round so, hopefully, you’ll kind of ‘freeze in’ the magnetic field which it sees now. I’ve now moved this piece of neodymium iron boron away from the magnet and I’ve put it next to a compass, and if I spin it round, the compass turns round. Izzie - Oh wow! So we have just literally taken something and turned it into a permanent magnet? Dave - Yeah. And because it’s neodymium iron boron this is now a very permanent magnet, and it will stay like this for years and years and years. Izzie - So would this method work with say the Earth’s magnetic field? Dave - You’d get a much much weaker magnetisation but you do get effect. So it’s really important in geology because if you get a molton piece of rock it’s basically like heating it up to red hot, and if you’ve got any little lumps of magnetic material in there, as it cools down they’ll freeze in the Earth’s magnetic field, which was there when it was created. And that can tell you stuff about the Earth’s magnetic field over time because if you know how old the rock is you know what the Earth’s magnetic field was like. Izzie - So is the Earth a giant permanent magnet? Dave - The short answer is no, and I can prove why it can’t be. What I’ve got here is an iron nut again next to a magnet - t sticks really quite effectively. Now what I’m going to do is heat this up. Izzie - And it’s back to the blow torch. Our Earth’s core is full of iron. We took this tiny iron bolt and heated it to, again, 800 degrees celsius. So we can use heat to turn certain metals into magnets, but it can also demagnetise them. Dave - And as I put it near the magnet it doesn’t stick at all. As it cools down eventually it does start to stick. Izzie - Oh gosh, yes - it’s just stuck to it. So what's going on here? Dave - If you heat up a ferromagnet like iron hot enough you give it enough energy that the individual atoms stop linking to each other and they just start to randomise. And that’s all pointing at completely random direction so it stops being even magnetic at all. This happens at a temperature called the Curie temperature. Then, as it cools down, they start lining up again and it starts becoming a magnetic material again. And so, this can prove that the Earth can’t be a permanent magnet because Curie points may be a thousand, maybe slightly above that, degrees celsius and the center of the Earth is much much hotter than that so it can’t possibly be a permanent magnet. Previous Why is the earth's magnetic field important? Can birds see Earth's magnetic field?